And handsome mariachi guys, too! My family had a ball making these mini piñatas last night for our Family Home Evening activity. The instructions can be found here (dancing girls) and here (band). I bought tissue paper at Target in the party goods section. There was a pack with lots of colors, including black and I had to buy a pack with several pinks as well. There’s enough tissue in the one multicolor pack to make a bazillion mini piñatas! The idea and tutorial came from the amazing blog Hideous! Dreadful! Stinky! These tutorials were outstanding! We only made one minor change - we drew on the eyelashes and lips with fine point Sharpies because they were too difficult and tiny for us to cut from tissue paper. This project took longer than I had planned, naturally, but was well worth the effort. We originally decided to each choose a friend to whom we wanted to give our piñatas, but, alas, the idea of giving these away was too much! That’s okay – everyone loudly insisted we make a new one every year. I think we will be better prepared to part with our creations next time around. Don’t these make you feel festive? What fun activities do you have planned for the holiday? I’d love to hear about it in the comments. I volunteered to provide a craft for my daughter’s second grade Valentine’s party tomorrow. I’ve known about it since October. I even chose the craft project during the Christmas holidays (found on Pinterest, of course). I wanted to send it into the classroom early so the teacher had time to familiarize herself with the project. Somehow, it is the day before and I finished assembling everything this morning. Time slips away so quickly sometimes! The good news is that this is really easy to put together – even on a large scale and even for second-graders to do on their own. I was asked to send in a craft that would be quick and simple for the children to do themselves. How About Orange had great directions and beautiful pictures, but I’ve added directions for efficiently assembling the materials and means for a large group of people to make this - such as 25 second-graders. Cut thread in 2-3 foot lengths depending on how long you want this to be. I used 5 hearts per hanging craft. Fold construction paper in half so it is 9 inches wide and 6 inches tall. With the open edges at the top and the fold at the bottom of the paper cutter, cut strips that are 1 1/2 inches wide. You will get 6 strips per sheet of construction paper. Layer 5 strips together with each one sandwiched within the next one. Thread needle and push it through all five strips at the same time. On the bottom (make sure points of hearts are facing down), tie on an item which will weight down the hanger a little. On top end, make a slip knot and then fold washi tape over the knot and ends so they are tucked into the tape. I slid the 5 strips to the top of the thread, folded them in half, then wrapped the thread around the strips so the toy was on top just to keep it all together. I put all of them in a ziplock bag, so the teacher will be able to pass them out easily without having to untangle them. 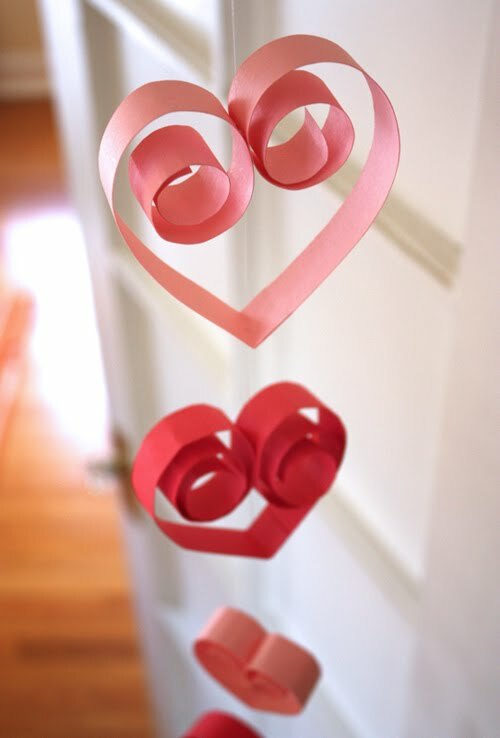 Now the children will be able to quickly make the hearts and easily have a finished craft. Carefully roll one half of the strip of paper around a pencil. You should roll from the edge towards the center fold. I rolled mine a little more than halfway to the fold. Repeat for the other side of the heart. Putting your fingers in the roll to hold it intact, put glue along the edge of the strip right where the two halves will meet in the middle. With the thread running through the strips of paper already, all you have to do is slide the other strips out of the way and place the thread into the glue so it is sandwiched between the two rolls when glued together. You will end up with something like this one. You can insert the pencil into the rolls to tighten the “curls” up a bit if you would like to do so. Repeat for the remaining strips. Be sure to space the hearts out along the entire thread. Hang using the slip knot at the top or use tape/magnets over the washi tape. The eraser at the bottom will hold it down so it hangs straight. I had the perfect little wall in my entry to hang this.